He said goodbye to the world of shipping after a long career in London and around the world. But his voyage continues through painting and for the last five years, nature, as the creator of Bralos Farm. 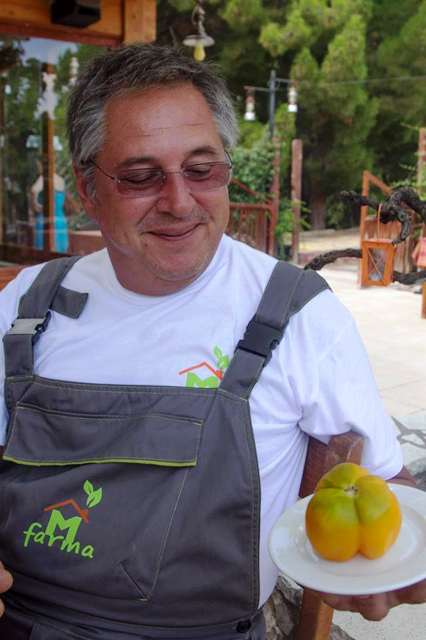 With Bralos Farm, Damis Pithis has sealed the promise he made to himself for a new life. See how it’s panning out below and perhaps discover some ideas for yourself. - Do you continue to paint? Of course, it’s the only thing that relaxes me. I use oils and my paintings are usually large. They are generally photorealistic, portraits or completely abstract with lots of colour. - Is your life as a farmer and livestock breeder depicted in your painting? No, I don’t see myself as a Greek Van Gogh, but I do transmit nature’s colours to the canvas in a different form. - Did something momentous happen which caused you to change course in life? No, not really. I had taken the decision some years ago that I would carry on in shipping until I was 50 and then devote myself to something I find pleasant and fulfilling. It was a promise I made to myself. Of course no matter how many plans we make, we can never be sure we will succeed, but I fortunately found myself in circumstances that enabled me to achieve what I wanted. Meanwhile, painting changed me as a person. From being a cold, calculating businessman – which is the only way you can survive in that world – I became a caring, mild-mannered and calm person. Besides, if you are not calm on the farm, without anxieties and financial worries, it will have an adverse impact on the animals and overall quality. It was a huge change that has fulfilled me and made me a better person; it was perhaps the spice I sought in my life. - What have you kept from the previous phase of your life? Everything. Each experience is assessed and “filed away” accordingly. - What would you not repeat? I would repeat everything, because what I am today is the result not only of my accomplishments but also my mistakes. - Why won’t you make money out of what you are doing now? I won’t allow my work to make me a profit, because whatever I earn is reinvested in the farm, either to improve the installations or the animals’ living conditions and quality. If you do it conscientiously and the way I do, without the use of fertilizers, pesticides or commercially prepared feed, the cost is enormous and these days simply cannot be covered. Particularly now, in this awful mess, the cost cannot be borne by consumers. So there is no room to either reduce your prices or cover your losses. Thankfully, because it is not an undertaking that I rely on to make a living but rather something that began as a hobby to fill my soul, the financial aspect does not concern me. - Are you satisfied with the result? I am pleased by the fact that whatever I have accomplished, I did so without having the slightest idea. I asked questions, read a lot and busied myself. I had no experience other than during my stay in England, when I visited a number of farms for hunting and there I experienced the feeling, smelled the air and liked it. I envied the farmers and livestock breeders there and considered what they were doing to be very worthwhile. To me, the idea of producing something to feed people is very important. The farm itself has progressed by leaps and bounds. The response from my customers, whether private individuals or professionals, has reached a point where I feel honoured when I hear what they are saying in the market. Of course it would be ideal if I could cut out the middlemen completely. In my view, the “potato movement” was one of the best things to happen in Greece, but unfortunately it has died out, despite having a considerable response. - How contradictory is it for there to be a turn towards quality products at a time when the average income has been cut dramatically? It is a mistake to equate quality with expense. At the supermarket you may see a chicken on offer for €2, but it comes from Romania and you don’t know what its living conditions were, what it had been eating, how it was slaughtered or how it reached the shelf, irrespective of any quality controls. No matter how hard they try to convince you, the product cannot be the same as the chicken on my farm which has been allowed to forage freely. So it will obviously be more expensive, but not so much more as to prevent a consumer eating a higher quality product. As I mentioned previously, most of my farming is organic, although I don’t advertise it as such, nor will I obtain organic certification, because not only do I consider it to be a mockery, but also the checks that are in place are laughable. I heard recently that the department of the Ministry of Rural Development which had been responsible for monitoring and checking the organic product certification agencies was abolished due to spending cuts. So, without any control whatsoever, producers can do as they please and – this is Greece, let’s not forget – bribery is alive and well in our sector too. It doesn’t really matter if there are organic food markets or not. What is important is for the consumer to be convinced that the producer from whom he or she purchases items is selling good, wholesome produce. Since the purchasing power of Greek consumers has fallen, I make sure that my prices reflect the situation in which we live. - What changes have you introduced through your different approach to farming? From the outset, I have taken steps to ensure I have only the best with regard to cattle, pigs, sheep and goats, in terms of breeds and their provenance. I attend exhibitions in Paris and seek out award-winning producers. Also, many animals are born on the farm which I care for in the best way possible; I even use folk remedies I have learned from some of the elderly ladies in the village to treat some of the animals’ minor ailments. Basically I do everything in my power to keep my standards as high as possible. And this is a conscious choice: I will lose some animals, I will be forced to remove them from the farm on account of illness, so I will lose some money, but the financial element is of no concern whatsoever to me. I stick to my principles. - What does this mean, that you are facing difficulties but are not concerned or you are having no difficulties and are not concerned? I am not at all concerned, whichever way you look at it! Difficulties give me the motivation to continue, otherwise it would be boring. - So what are the greatest difficulties you face? Simple things... the weather, snow, frost. Nothing else; all other problems can be overcome. I have not become entangled with the Greek state because I never asked for anything. I don’t want anything. I am not involved with the various ministries; I have obtained all the necessary permits. I don’t want any subsidies or loans. - How will the taxation of agricultural land affect you? In the context of the general expenses of the undertaking, this will increase the burden only very slightly. If one sees and considers how Greek farmers and livestock breeders live in the countryside, it is quite sad to see this additional tax being imposed at a time when everything has gone up, even wages, despite claims to the contrary, because there is no available manpower in rural areas. I really do feel sorry for these hapless Greeks. It would be irreverent of me to say I feel sorry for myself, because if I too were like those Greeks, I would never have gotten where I am today. I wouldn’t have created this farm, at least not in its present form, if I had started out in some village, after inheriting a small piece of land from my father. This is the unfortunate thing about Greece; young people today cannot create something worthwhile, given the complete lack of assistance and support from the state. I cannot understand how our politicians have the audacity to speak about incentives and grants, for example when they say the state is giving away land for cultivation. Tell me... how many people have left the city and returned to the countryside with the help of what the ministries and governments brazenly advertise? Hardly anyone! Many would like to, but there is no infrastructure. The veterinary practices have closed, the services have changed and you must really struggle to get by. Some people just can’t handle it. To obtain a permit to slaughter a calf, you may have to travel about 50 kilometres, because there is no longer a veterinary practice nearby, so you must go from Atalanti to Amfikleia or Lamia to find a vet who will give you a stamp, because they can’t afford to make three stamps and have them in three different locations, which means you are forced to run around, wasting time as well as money for petrol. It really is that bad. - How would you comment on the general view that farmers just sit around, waiting for their subsidies? This is indeed the general view and it’s not that far from reality. However, it’s not the fault of Greek farmers but the system that has given them these benefits. The state is to blame for a situation in which farmers sit around in the coffee shop and collect subsidies by declaring the number of sheep they have, with the same sheep being declared by several different farmers, with the result that the village appears to have 3,000 sheep when in reality it has only 300. Of course such practices are being stamped out all over Europe. The people concerned will most probably be forced to return to the land. - There has been much talk about people returning to their rural roots. Do you believe it’s true? No, not at all. My village, for instance – Bralos – had 250 inhabitants, now it has 200, because 50 have left. In Palaiochori there were 400 inhabitants, now there are 405, because five young people originally from the area have returned and are gradually trying to do something. One has opened an off-licence, another a small grocery. No one has become engaged in production or with the land. They prefer to come to the village and open a coffee shop or bar. - Where is the country headed? Where it was 50 years ago. Afterwards, we shall start afresh, without excuses, because we must achieve what we once accomplished as a people, which was amazing and gave the country its good name in the world. Perhaps the younger generation can remedy the ills that have plagued the country. All this pressure and the changes we are going through will have a positive outcome. - But for about 50 years most Greeks were living in poverty. Yes, but then people really worked and found opportunities to create something, and the conditions at the time allowed them to do so. Then we went soft and became spoiled. And the seeds of the tragic changes that have led us from bad to worse were sown in the 90s. Returning to the past is not a bad thing. It is a period I remember from childhood and everything was much better. - Are you perhaps idealising a past that had its own problems... poverty, fervour, division and exclusion? I wouldn’t like to enter into a political discussion, or even social. There was indeed poverty, just like today, which may even be worse. Back then, Greeks at least knew how to work, today they don’t. Go into a coffee shop in Athens... you’ll find it full of young people, not pensioners. In those days people weren’t spoiled; on the contrary, they worked hard and enjoyed the fruits of their labour despite the difficulties. Nowadays, our children are spoiled. They see other kids with 500 things and this creates enormous problems within the family. Back then, there were no such comparisons to be made; you had the same as the person next to you, and the person next to them, and to acquire something you had to make an effort. Today, with a few tears and a little whining, it’s yours. - What changes would you like to see in us? I would like us to become more real and genuine. To look at life with love in our heart, because when we love our life we become better people and the country will change. And this applies from the ruling class right down to the last citizen. - How can we attain our objectives? With hard work and enormous willpower. This helps too, but it’s not the be all and end all. - What do you experience where you live, which we don’t? - How do you detach yourself from your animals, with which you appear to have an emotional bond? You have to see things from a purely professional perspective. It is a tough decision, especially when I myself have had to slaughter some animals. It’s not pleasant. You must try to shield yourself. But it’s certainly no doctor-patient relationship, were the former use the knife to cure the latter. When I slaughter one of my animals, I end its life and this is not good. - In a world of industrialised farming and livestock breeding, is there room for exceptions such as yours? It’s purely a matter of the attitude of each producer and actual needs. The bigger an undertaking becomes, the greater its decline. When it’s just you, you can maintain standards more easily; you go where you want and control things. Let’s say I produce my own feed, which I control rigorously. If I am obliged to buy from a nearby producer, there is no way for me to know what he has done, nor can I rely on certification, so my quality will inevitably be downgraded. So it’s a matter of what you want to attain, how conscientious you are as an individual and the extent to which you want to transmit your conscientiousness to your work. I simply wish to give my customers exactly what I would give my own children to eat. Someone who loves their job and whatever they do in general. When you love, you give yourself and reach your target, and to you this will be 100% success.